If you have never cooked on a boat before, the first thing you’ll notice between cooking on a boat’s galley and cooking at home is the cramped space you’ll need to get accustomed to on a boat so it’s important that you set up your galley in an organised manner. There is not a great deal of storage space in the galley of a boat so when you’re setting up, think minimalist and don’t try to bring a full set of pots and pans with you. Basically, one frying pan and one saucepan should be sufficient for most small craft. Then you’ll need crockery and cutlery. If you insist on having ‘proper’ plates and bowls, just bring one of each for every person. Many boaters will simply use Styrofoam, unbreakable plastic and paper plates, bowls and cups which will not only take up less room but are safer as it’s important to remember that cooking on a boat tends to be a little more precarious than cooking at home and the fewer items that can be broken, the better. So china plates and anything made of glass are obviously items which might be better left at home. You’ll want to know exactly where everything is in your galley. Scrabbling around different cupboards looking for cooking utensils is no fun, especially as your mind should be concentrating on the safety of what’s happening on the stove itself. Therefore, depending on space and the way the galley is set up, keep pans and crockery in one cupboard, cutlery and things like a spatula, wooden spoon, tin opener and corkscrew in a nearby drawer and then store your food by category – tinned food and jars if you have them should be stored securely so that they can’t fly out of the cupboard and break or hit people on the head. Fresh food such as meat and fish should be kept in the fridge or put into ziplock bags and labelled and kept in a cooler of ice. Also ensure that you keep a separate cupboard for cleaning materials such as dishcloths, tea towels, hand soap, washing up liquid and bleach, for example. These are all items you’ll want to be able to locate quickly given that spillages are common and you’ll want to keep such a tiny space clean and germ free. Therefore, you’ll also want to ensure that you have a pedal bin or similar which is preferably attached to a wall and is within easy reach of where you’re preparing the food. Safety latches on cupboards are also a good idea, especially if you’re going to be cooking on the move. 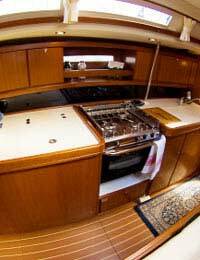 There’s a wide variety of different specialised equipment and fixtures which can make life a lot easier in the galley of a boat. For example, knives can be extremely dangerous if they can slide off counter surfaces so you can buy magnetic strips which you can fix to worktops or walls and place the knives on them when they’re not being used. You can also get cutting boards which you can clamp on to a surface to ensure they don’t slip and slide when you’re working on them. You can also buy pockets which you can attach to walls in which you can store knives, for example and you can also get hanging nets in which you can put fresh produce such as fruit and vegetables. In fact, there are many different items which help increase storage space if your galley doesn’t have many cupboards or drawers. Although cooking and eating on a boat is part of the fun of the boating experience, it’s a lot more stressful if you are the one who is doing most of the preparation and cooking. Therefore, a well set up and organised galley will make life a lot easier.